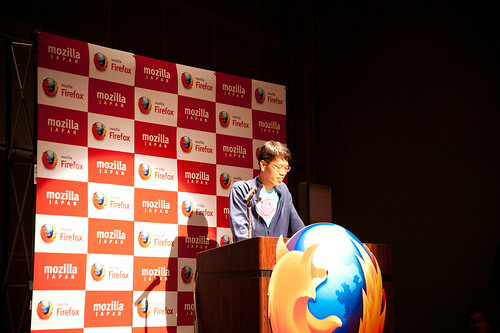 Mr. Channy Yun, a leader of Mozilla Korean community was invited by Mozilla Japan in Firefox Developers Conference 2010. 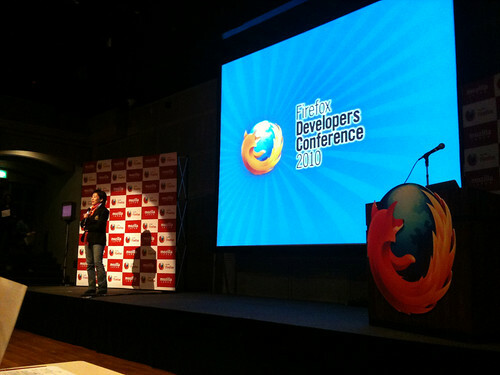 In this event, over 300 Japanese web developers were joined and learned Firefox 4’s new technologies including Panorama, mobile browser and HTML5. In lighting talk of final session, Channy Yun gave a presentation about HTML5 in Korea. Despite of IE-dominant market in desktop, for one year, it sold over 5 millions HTML5 capable smart phones (Android and iPhone). So HTML5 are very active in mobile and it will give effects to desktop browser market too. Web Standards Korea and Google Korea today announced the results of a survey on web openness with a pool of 348 developers. According to the study, developers believed that web openness helps promote continuous innovation, while 75% of respondents believed that multiple government regulations(34%) and isolated solutions that deviate from global standards(41%) were the greatest obstacles to fostering an open web environment. In addition, only 13% of the developers answered that Korea’s web environment did not lag behind that of other countries. The majority answered that the Korean web environment fell behind others by 1-5 years(57%), and some even said 5-10 years (26%). As to what issues need to be resolved immediately to eliminate the discrepancy between local standards and global standards, 74% of the respondents replied ‘Active X’, followed by online payment policy(17%), and name verification policy(7%). In response to an open-ended question asking what is further required for the advancement of the mobile internet, which is recently enjoying a tremendous rise in popularity, 15% of respondents replied ‘web standardization/global standards, 12% replied ‘expansion of wireless internet network,’ and 7% said ‘deregulation’. On the other hand, a very positive evaluation was given to the benefits of web openness, with 50% of the respondents replying that web openness promotes continuous innovation, 31% saying that it maximizes efficiency of development and 17% responding that it helps facilitate entry into the global market. Also, almost 45% of respondents answered that they set open browsers such as Firefox(20%), Chrome(12%), Safari(11%) and Opera(1%) as the default browsers, showing high preference of open browsers among developers. Channy Yun, the Manager of the Web Standards Korea, stated that “More innovation can be achieved in the web environment when openness is guaranteed,” adding, “As this study reveals, developers, the industry and the government should come together to find a way to resolve issues hindering web development, such as the implementation of global standards and the relaxation of excessive regulations. The above study was conducted by the Web Standards Korea and Google Korea to understand the current situation of web openness in Korea as well as to obtain a deeper understanding of the direction the web should be headed in. The survey was conducted on developers that attended the HTML5 Open Conference, where a total of 384 developers responded. The HTML5 Open Conference hosted by Web Standards Korea, was the first HTML5 technology related conference of its kind in Korea. The Conference was held to communicate that HTML5, the next-generation web application platform, is an open web standard created to enhance user experience.